When tensions rise between parties, the temptation to escalate commitment to a specified position can be overwhelming—and the likelihood that negotiations will resolve the dispute becomes increasingly slim. In an attempt to examine whether the escalating tensions between the United States and Iran can be resolved through diplomatic negotiations, former CIA intelligence official Kenneth Pollack and his colleagues at the Brookings Institution in Washington, D.C. organized a U.S.-Iran war game exercise in September that simulated the escalating conflict between the two nations. Pollack described the results of the exercise in a September 24 interview with Robert Siegel on National Public Radio’s All Things Considered. Teams playing the roles of U.S. and Iranian policymakers in the Brookings exercise were faced with a hypothetical but feasible scenario that included cyber attacks and assassinations of scientists. Actual former high-ranking U.S. government officials – whose identities Pollack protected – took on roles they had played in real life; Iranian-American and American experts on Iran comprised the Iranian team. Pollack and his fellow researchers were interested in exploring whether diplomacy could prevail over threats of war in a highly charged atmosphere. The game opened with an Iranian terrorist attack. 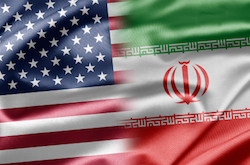 The U.S. team decided to respond to the attack by striking a remote Iranian Revolutionary Guards’ facility, a reaction that the American team hoped the Iran team would view as minimal—the least aggressive response acceptable to the American people. In fact, the Iran team viewed the strike as highly provocative—“as the Americans crossing a red line,” according to Pollack. And because the Iranian team had previously committed to closing the Strait of Hormuz (a key route for international trade) in the event of a U.S. attack, they felt compelled to do so. The American team said later that if the Iranian team had taken any of the other actions it was considering, the American response would have been peaceful. But the Iran team’s actions in the Strait of Hormuz “pushed the Americans higher up on the escalation ladder,” said Pollack. How did the game end? With the Americans preparing to launch a massive military operation against Iran that would include attacks on Iran’s coastal defenses, surface-to-air missile batteries, and so on – and possibly also attacks on the Iranian nuclear program, according to Pollack. In anticipation of this aggression, the Iran team said it was prepared to fight on “forever.” The game ended there. We cannot assume that the results of the simulation reflect how actual decision makers would behave if a similar scenario played out in the real world. However, the results do serve as a cautionary reminder of the common tendency for negotiators to escalate commitment to a previously chosen course of action. Notably, at key moments in the Brookings simulation, each team said it would have responded peacefully if the other side had made a slightly different move. The ultimate outcome suggests that negotiators would do well to resist the temptation to make rigid commitments, threats, and other inflammatory statements that could trap them into a corner and cause a dispute to spiral out of control.